The Laika Trio celebrated their 8th birthday on Oct. 25th. Hard to believe that much time has gone by...I remember vividly when they were little black and white slugs. They had an above average day, getting an extra long walk on a gorgeous rain-free morning. They got to bark at geese, found a box turtle on a woods path, had a cat sighting, and grumped at a Great Pyrenees. What more could you ask for? Well, they aren't asking for one, but I decided to get them a mascot. After all, October is American Humane's Adopt-A-Dog month. I was sleuthing around on PetFinder months ago and I noticed this little terrier. I would check on him periodically and he was always STILL THERE. More months went by and I still thought of him. I finally emailed to get some more info on the wee beast. I wouldn't consider him if I thought he would push these guys' buttons. Wouldn't you know it, he was still available and he is reported to be extremely laid back. (Damn) The next challenge was convincing Chappy...He thinks four dogs in a townhome is a bit extreme, but I really see it as 3.25. 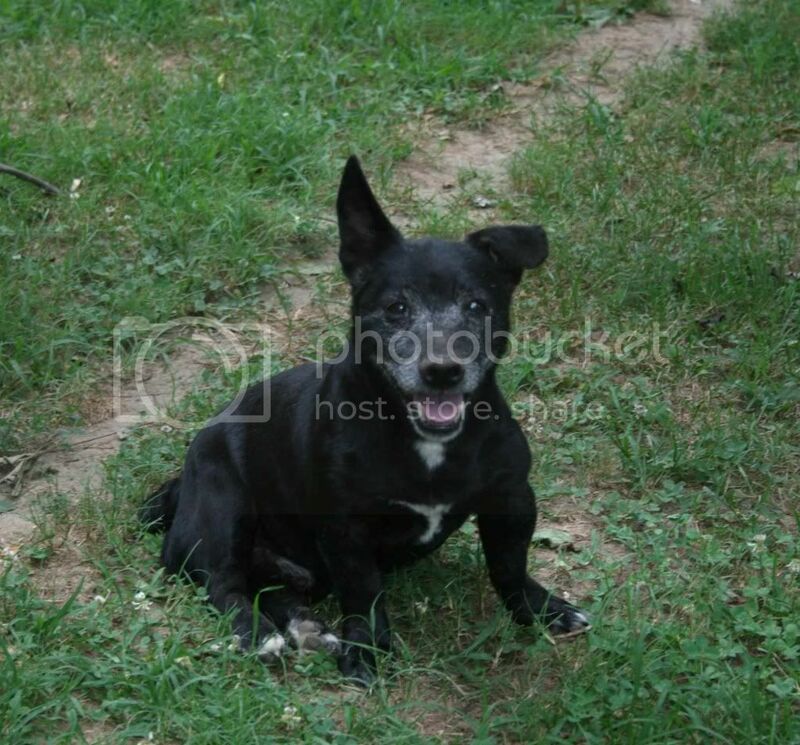 Please let me introduce this Patterdale mix. I think we will name him "Tangent". (He should have a name that starts with 'T' like everyone else.) One of these is not like the others, but he does match our color scheme. He is currently in Tennessee and will be transported to Virginia next weekend. Aww...it was meant to be! Congrats on the new addition...hope the Trio will be very welcoming. Tangent is really cute! Congrats! Well, sadly Tangent's arrival has been postponed. He went in for his exam for travel and health certificate and the vet there heard some crackles in his lungs. They estimated that he is at least 10 years old, if not older. He is scheduled for chest x-rays on Monday. We will see what he has going on and go from there. He is feeling perky and doesn't have a cough. No heart murmur was detected and his heartworm test was negative. Fingers crossed that it is something manageable and he can come live out his days with us. I will be very sad if he has a chest full of cancer or something awful. How did Tangent's chest x-rays go? Sending good vibes his way! Sorry to hear about the delay, but hopefully all is well! Let us know how the x-rays went and when/if he is coming home. Hey everyone...thanks for the well-wishes. Tangent has a case of 'old dog lungs'. Some mild COPD (Chronic Obstructive Pulmonary Disease) and radiographic changes associated with that. It's nothing contagious, he feels peppy, and was prescribed no medications at this time. He is rescheduled for transport next weekend! Mary Ruth at Russell Rescue says that he's already packed his bags! I can check him out more thoroughly once he arrives. If he gets to hang around on our couch for a few short years, it will still be fun. I'll get some intro pics. Glad to hear it's nothing to worry about. I hope the transport goes well!